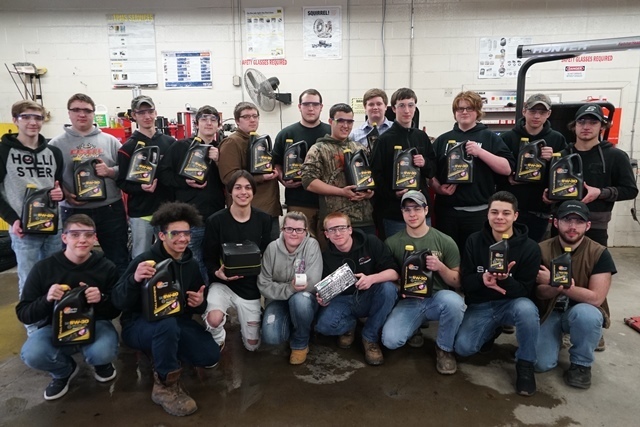 The Automotive Technology program at the Charles H. Bohlen, Jr. Technical Center was able to purchase some new classroom supplies thanks to a $1000 award from Valvoline. Twenty four students in the class participated in the Valvoline Ignition Program, which consisted of students watching a video on motor oil, taking an online quiz on the content, and submitting those quizzes back to Valvoline for consideration. The Bohlen program, taught by Randy Fulkerson, was selected as one of ten winners to receive the $1000 award. Participating students also earned certificates from the company that can be used for their resumes and portfolios. The $1000 was spent on purchasing an oil change label printer as well as 72 quarts of Valvoline motor oil.